The recently completed renovation of Faunce House features the creation of the Stephen Robert '62 Campus Center. One of the most visible improvements to the building is the renovation of Faunce Arch, one of the busiest portals into Brown's spacious Main Green. In accordance with the architects' (Schwartz/Silver Architects) vision, the arch's brick walls have been replaced with tall glass surfaces, transforming this formerly dark passage into a clean, bright, and active entrance to the Campus Center. The use of glass and light also provide greater visibility in and out of the Welcome Center. An integral part of the renovation was Malcolm Grear Designers' treatment of the signs and donor recognition. 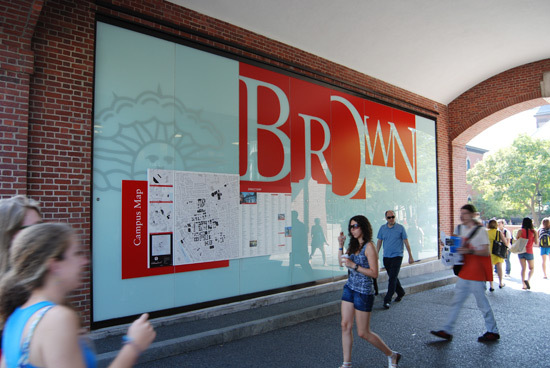 Most noticeable among the signs is their interpretation of the University's brand, rendered in large, truncated, letterforms "BROWN" reversed against a red background. These are integrated into the east side of the arch along with a new campus map and directory. The result is a warm and welcoming visual statement that greets pedestrians approaching the arch from either direction. The project's donors are recognized through a system of beautiful red and black slate plaques which name several of the Center's prominent spaces such as the Leung Family Gallery, Petteruti Lounge, and Kasper Multipurpose Room. Read more about the Faunce House renovation in the current issue of the Brown Alumni Magazine. View more images of the Campus Center.